Welcome to the first Muffin Tin Monday blog link up of 2011. I am so excited about what the coming year has in store. I have truly truly been blessed to know and connect with all of you and look forward to more in the coming year. Getting my kids to eat healthier is not just a New Year's resolution for me, it's a lifestyle goal. I am daily challenging myself to think outside the box when it comes to feeding them and I think encouraging a love for healthy food is the cornerstone to building healthy eaters. So....look for more of that on MTM in the coming year! This week's theme is Food Picks, Skewers and Kebabs. 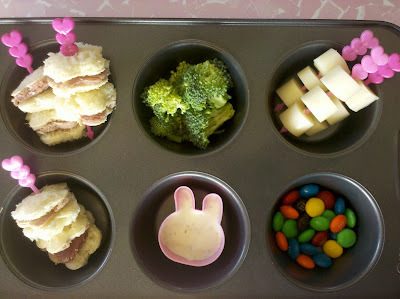 mozzarella cheese pieces on food picks and m&m candies. What did you make for MTM this week? Won't you share it with us? Remember that the link up accepts submissions all week long. 27. Life is sooo good. . . This year I resolve to be more creative with my MTM. LOL HAPPY NEW YEAR!!!! We also want to adopt a more healthy lifestyle and will make full use of MTM for that! I love the heart picks. I knew I had seen them somewhere, just couldn't remember. Thanks for all the links! I love the little bunny in your muffin tin meal. Is that a sushi mold? Happy New Year Michelle! I just wanted to thank you again for doing Muffin Tin Monday. As a participating blogger, it has increased my pageviews, followers, and I get such wonderful comments every week. I do another weekly food linkup, and rarely get a comment (although I do get loads of views.) I love the sense of community and support the MTMers have with each other that I just don't see with other link-up parties. Thank you for doing something that not only inspires me each week, but that grows my blog following, and makes me feel a sense of community with some wonderful, friendly, supportive bloggers!